Fill the cylinder with water up to the red line. Hang the watch on the hook, out of the water and screw on the lid tightly. Be sure that the watch is in the position completely out of the water. 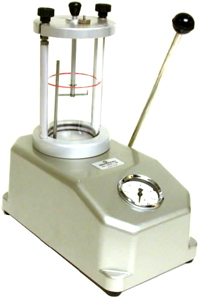 Increase pressure with the lever, pumping up to any given pressure. Immerse the watch into the water. Release air pressure gradually by opening the air-releasing valve. If the watch is not perfectly water-tight, bubbles will emerge where the water tightness is incomplete (e.g. round the crown, glass, back of the case). Please note some bubbles may also appear on the external turning bezel, or the crown, this is because of a little residual external air. Test finish, take out the watch before the indicator reaches zero. Most people ask: Can I wear my watch to swim ? 1. Check the water proof of your watch before each Scuba Diving and every year because the water proof mechanism may fail because of aging or daily damage. 2. Do not put the watch in water with soap or detergent. Soap reduces the surface tension of water and let the water goes into the watch easily. Detergent has the same effect as soap and it may damage the rubber seal, too. A watch marked 50 M of water resist means it can stay steadily under the 50 M of water. When you are swimming, the watch moves violently with your body; therefore, the actual pressure applies on the watch is much more than the pressure applies on the watch under 50 M of water. That is why you cannot wear it to swim. For the same reason, do not flush a watch under the tap, the pressure of running water is damaging for some expensive water resist dress watch. 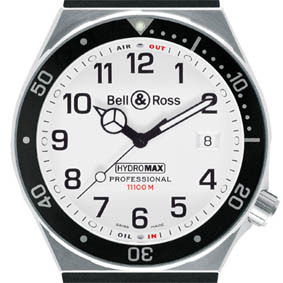 It can resist the pressure of 1110 bar or 11,000 M depth of water because the case of this watch is completely filled with a transparent oil called Hydroil®.